This has been an amazing week in my life. We are having a great Vacation Bible School — several of our students have crossed the line of faith — and we are having a great time learning and singing the songs. We have a great staff of volunteers, teachers, and assistants. It has been a wonderful week. It has been a great week running-wise as well. Since I got stopped short of my 7 mile goal on Wednesday, I was determined to do what it took to get 7+ miles in today. A little cold front came through this morning, so it was cooler than the last few mornings and a welcome relief. I think that is one reason things went well. I can’t say that I struggled on any part of the 7 mile run this morning. One funny thing that happened was that I outran a garbage truck that was picking up garbage — I thought to myself — “Faster than a speeding garbage truck picking up garbage.” I am improving and this week I have really noticed that my overall speed is faster, and I have more endurance. This is so amazing. Who would have ever thought that when I started running eleven months ago, I would be running 7+ miles — definitely not me! Pressing On! 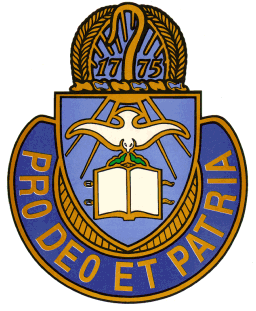 Today is the 235th birthday of the United States Army Chaplain Corps. As many of you know, Pam and I have a special place in our hearts for those who serve in the military and not just one particular branch. We have several friends who are Army chaplains and it is a great thing to encourage them. In Fort Bragg, NC, a North Carolina Army base will celebrate the Army Chaplain Corps’ 235th birthday with a commemorative jump. About 400 Fort Bragg soldiers, including chaplains from many of the airborne units based at the post, will jump on Wednesday onto Sicily Drop Zone. The jump will be followed by a free barbecue lunch. Remember to keep those who minister to our military personnel in your prayers — they have a great mission work to do. Happy 235th Birthday. Today’s goal was a long, easy run — hopefully 7 miles. That is the next milestone I need to pass to work on this 10 miler this fall. I ran 6.3 miles this morning — not quite my goal, but that is the second time this week I have run 6 miles, which brings my total running miles to 15. I’ve also walked 10 miles this week. There are two cool things that happened during this morning’s run. It is still quite warm in the mornings, so it was a good workout. I started out a little slower than usual. What I noticed after about a mile of running is that I wasn’t out of breath and even better, I could breath through my nose while running. How cool is that????? I was able to do that several times during the run — which is something that hasn’t happened up to this point. The other thing was that for the first 5.5 miles, it was probably the most consistent run — no cramps — no feeling really tired — or out of breath. It was a really fun run until my body ran out of fuel at the end. Anyway, I still consider this morning’s run a success — eleven months ago, I couldn’t run a mile. Pressing On! If you’re going to go to all the trouble of learning the song and performing it — then SING IT! Sing it loud. Sing it with feeling and like you mean it! The weather broke a little bit this morning and will be much better by the end of the week. Still it was another early morning run, with my goal of running 6 miles today. I started a little slower than I have the last few times and that made quite a difference. By mid-run I was feeling great. The fact the sun wasn’t beating down yet, was a nice bonus. It was partly cloudy, so the sun wasn’t always shining this morning. By late run, I was feeling even better than mid-run. I really didn’t even notice my breathing — that’s when you know everything is working well. I was able to complete six miles today. My next major step is to run the Staunton Ten Miler, so I need to start building speed and endurance. Pressing On!